Q: What needle do i require for my modified engine or non-standard application? A: Needle profiles were carefully selected for standard applications when the carburettors originally left the SU factory to suit the vehicle. However if an engine has been modified this may no longer be the most suitable. Because of the huge range of needles manufactured it is very difficult to advise on needles for modified or non-standard applications. To Help you try and find a suitbale needle we have a needle profile book ALT 9601. We are currently working on offering a replacement 'Needle Comparison Chart' as the Minty Lamb site that is no longer available. A: The most important factor in identifying a carburettor is the 'Specification Tag' which is normally either attached to the top of the float chamber or to one of the suction chamber screws. With this information you can find the correct kits and spares to suit your vehicle. On Carburettors built before 1952 and the use of specification tags, the other way to identify a carburettor is by the number cast onto the side of the main body. If you have this number we can help you to identify the model of carburettor you have fitted. Q: I cannot find a listing for the SU's fitted to my Datsun? A: Something that we are asked quite a lot is that customers are unable to find information on the SU's fitted to their Datsun's. The reason behind this is that the carburettors fitted are a Japanese derivative made under licence by Hitachi of the HS type carburettor. Genuine SU parts are not compatible with the Japanese copy. Q: How much damper oil should i use and what type? A: We recommend using a straight grade SAE 20 oil for the damper in your SU carburettor. This is filled until the level is just below the top of the hollow piston rod. Engine oil will not be suitable as it will be a multi-grade. A: Yes our parts are suitable for modern fuels. As a company we have improved our products including fuel hose and floats to be compatible with fuel changes. Q: How do i find the correct service or rebuild kit for my vehicle? A: The easiest way to find the correct service or rebuild kit for your vehicle is by using the 'vehicle search' on our homepage. This way you are making sure you are selecting the right kit of parts rather than pickign a kit which is for that carburettor type but may not be suitable for your vehicle. 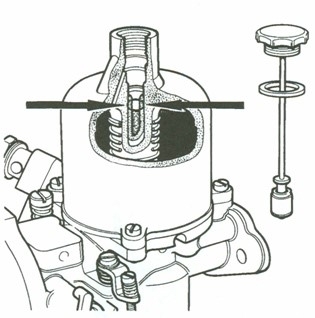 Q: Why are there no piston springs or damper rods in my carburettor? A: Earlier Pre-war SU carburettors used weighted pistons so damper assemblies and piston springs were not required, also weighted pistons often had solid rods so a damper cannot be fitted. There is a brief cross over period post war when assemblies were changed to aluminium pistons with dampers assemblies and springs. If you are unsure what your application should use please contact our technical Sales team and we can investigate what should be fitted. Q: Why are there no holes drilled on the new spindles supplied to fit the throttle stop lever? A: Every specification has slight variations including the position in which the throttle stop levers are pinned onto the spindle. Because of this you will need to mark up new spindles and drill and pin them to match the old spindle you are taking out of the carburettor. For more information on how to fit them you can find this information in our workshop manual ALT 9525. Q: I am within the classic car trade how can i order & how can i get trade discount on your products ? A: If you are with the classic car trade and wish to buy parts from us please email us at: trade@burlen.co.uk. Our website is currently setup for retail use and will not discount products for trade customers.